It’s the most wonderful time of year! The holidays are approaching, and with it comes a retail event that makes everyone happy. Not only do businesses do the bulk of their sales this time of year, but shoppers are gladly separating themselves from their hard-earned cash, and even children are excited, as they are the lucky recipients of much of this shopping frenzy. For most businesses, November marks the kickoff to the holiday shopping period. What day is more characteristic of holiday shopping than Black Friday and Cyber Monday in the US? Black Friday isn’t just a day for big sales, it’s become a part of the American cultural identity to get up at 3am the day after Thanksgiving (or at 6pm on Thanksgiving day!) and stand in line for hours to get the best deal on the latest gadgets. Seasoned retailers know how to take advantage of the hordes of willing shoppers, but for small businesses (or new eCommerce businesses), there are a few marketing tips that will help you see a return on this holiday sales period. If you’re just starting your eCommerce business, use the following 6 tips to help you prepare for Black Friday and Cyber Monday! 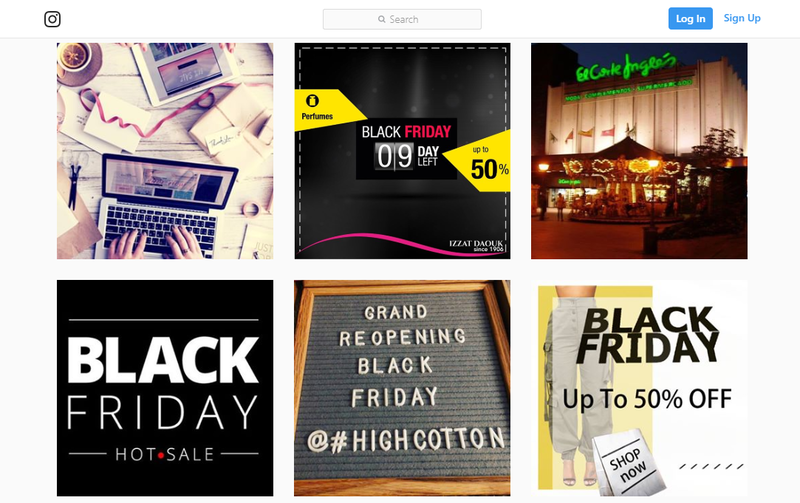 Create events for Black Friday, Small Business Saturday, and Cyber Monday on social media platforms like Facebook where customers can indicate their intent to attend the event. Create the event several weeks in advance, and post engaging content and videos ramping up to the sale. Live feeds can engage customers as well. The hype can be further accelerated by linking to your website and other social media accounts, e.g. Twitter and Instagram, to create a omnichannel approach. Millennial shoppers love Instagram worthy shots, sneak peaks, and early shopping passes. Polls also create engagement to get people involved. Remember, the more people engage with your social media, the more people see it. Get your email lists ready, and your marketing emails pre-written. Customers are more likely to open emails during this sales weekend as they look for the best deals. Use abandoned cart emails as well as special offers to entice customers to complete their purchase. Don’t forget to invite your customers to shop each day of your event. If you need inspiration for #BFCM emails, check out these Really Good Emails examples. This may seem scary, especially for small or new eCommerce businesses. Large discounts can mean minimizing profit margins, and some small businesses have reported operating in the red over Black Friday weekend. However, your customers are looking for the best deals on their must have items. In 2017, the average shopper spent $335.47 over the Thanksgiving weekend. Advertise the sale prices of your top products ahead of time, so bargain hunting shoppers can add your store to their agenda. Here are a few tips for maximizing your sales while still providing customers with the prices they want. Have discounted prices available from Black Friday through Cyber Monday. These don’t have to be the biggest sales, but they need to be consistent so that your customers know you are participating. Offer doorbusters to create a sense of urgency. If you only release a list of special products at special pricing during special times, these should be your best deals. Email this list out to your customers ahead of time, so they know when to expect them. Create special product bundles to increase the value of the overall package. This can be done by including an eBook with purchase, offering free add-ons (like free SD cards for tablets) with the purchase of a product, or by combining (or merchandising) complimentary items together. In 2017 Consumers spent roughly $85.00 on themselves Black Friday weekend. Don’t forget the “Treat Yo’ Self” crowd. Offer “Buy 1 Get 1 Free” sales on specialized high demand products. This gives the customer the opportunity to purchase something they want for themselves, and have an extra as a gift. Give your customers an experience that they will remember. They can shop with the big box retailers, but show them how supporting a small business makes a difference. If you are have a brick-and-mortar location, like a pop-up store, create a specialized shopping atmosphere for Black Friday weekend. Also consider having different offers available for Black Friday, Small Business Saturday, and Cyber Monday. Invest in holiday scented wax melts to place strategically around the store. Offer fresh baked cookies and hot cocoa to your customers. If appropriate you can even have live music playing. A magical holiday shopping experience, paired with Black Friday/Cyber Monday pricing will have your customers coming back year after year. eCommerce only? That’s ok. Offer free gift wrapping for that weekend, or free shipping. Offer scratch-offs, that have different savings on them for a future purchase, included in every order that weekend. Include all of these in your advertising for the sale weekend for best results. Dress up for the holiday! Modify your landing page in the days leading up to the sale. Use a consumer’s fear of missing out to generate excitement with a countdown clock front and center. Place your top selling items and your best deals on the landing page for easy access for your customers. Customers love to see how other customers use your products. Link to Instagram with a feed that populates with your brand hashtag, so your customers can see your products in action. It’s time to get your business trending. If your company is eCommerce only, take a hint from subscription box company IPSY. They do a monthly giveaway on social media channels by encouraging their customers to post pictures of their favorite products with specific hashtags. Keep the conversation going by creating a hashtag for your brand and asking your customers to use it. Do a monthly drawing for a gift card. If you have a physical location, then do something to make your store Insta-worthy (that is, when a picture is worthy enough to be posted to Instagram). Feature walls, celebrity guests, oversized décor, or fun character cut outs can encourage your customers to post to social media. You can also offer a 10% discount for any customer who checks into your location via Facebook. Black Friday and Cyber Monday may be two separate events, but your customers are going to shop all weekend long. If not with you, then with someone else. Stay relevant by being open (physically, not spiritually), engage on social media, creating an atmosphere, and having special offers for the holiday. Remember that Black Friday and Cyber Monday #BFCM aren’t just commercial holidays, they are holiday traditions that have been passed down by generations. Not all customers are eager to brave the crowds, but the ones that do are loyal. Winning them over with your Black Friday/Cyber Monday experience will ensure loyal patronage for your business, not just during the holidays but year-round. Even the most frugal customers are willing to justify their spending during the holidays, they just need to be reminded that the holidays are here. A little tinsel and a few peppermint scented candles are enough to encourage even the Grinchiest customers to get into the holiday spirit. Where you can control your inventory, orders and manufacturing workflows, all in one place.